Nanomedicine is utilizing nanotechnology phenomena to achieve highly selective medical intervention at the molecular level where biological molecules and living cells function. This is helping medical researchers selectively target and treat cancer and heart disease with minimal side effects. One approach is to fabricate hollow nano-capsules of about 100 nanometers filled with medication that attacks cancer cells but not normal cells. The exterior of the sphere is small enough that it can be tagged with a molecule that seeks out the tumor. When injected into the bloodstream, the medication is released when the tagged capsule penetrates the tumor and dissolves, and preferentially attacks the tumor with little harm to the surrounding healthy tissue. The capsules can also be filled with radioactive particles that, when absorbed, irradiate the tumor from within but spare the surrounding healthy tissue. A similar approach is to fabricate approximately 100 nanometer particles designed to preferentially absorb infrared light that passes harmlessly through tissue. The nanoparticle can penetrate the tumor but not healthy tissue. When treated with infrared light, the particles heat up and destroy the tumor from within. Tiny nanosensors have been fabricated and endowed with sensitive detection chemicals that enable rapid and inexpensive diagnosis of disease. Often these sensors need access to only a single drop of blood, urine, or even human breath to pick up and identify traces of disease in the body. New prosthetic and medical implants are being engineered with molecular covers tailored to interact with the body in beneficial ways. Artificial knees and hip joints made of metal have been bombarded with harmless atoms of carbon or nitrogen and surgically implanted to replace failing joints. This surface treatment essentially eliminates corrosive wear in the body that can loosen the artificial joint and inflame surrounding tissue. Drugs are being processed with nanometer dimensions that greatly accelerate the reactivity and effectiveness of the drug in the body because of the increased surface area, or make it possible to be absorbed through the skin directly into the blood. Nanoparticles with tailored properties can be injected into the blood to selectively absorb and treat drug poisoning or overdoses. An intriguing strategy in the “bottom-up” approach to nanofabrication is biological or molecular self assembly. This strategy capitalizes on nature’s inherent ability to recognize similar entities and assemble them into regular arrays through chemical reactions. There are a number of promising advantages of utilizing this strategy. First, there are several examples in nature from which to learn and mimic (like DNA and crystal growth). Second, self assembly accomplishes the most difficult part of nanofabrication for us naturally; namely, creating the template and assembling structures at the atomic level. 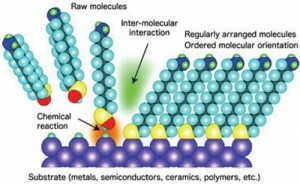 We have already discussed how DNA can be used in “bottom-up” fabrication of integrated electronic structures and sensors, and researchers have even fabricated a transistor – the building block of semiconductor electronics – with self assembly techniques by chemically bonding carbon nanotubes and metal contacts onto specific sites on DNA molecules. A variety of templates for nanofabrication can also be made from Self-Assembled Monolayers (SAMs) formed on a solid surface by spontaneous organization of molecules. SAMs are a model system for the study of organic and biological interfaces and are of technical interest for the fabrication of sensors, transducers, protective layers, for lubrication, and as patternable materials in lithography applications with nanometer precision. In addition, SAM arrays of immobilized single-stranded DNA probes, so-called DNA chips, may revolutionize genetic analysis for disease detection, toxicology, forensics, industrial processing, and environmental monitoring.